On September 18 to 20, I had the opportunity to attend the VR/AR Summit at the TechXLR8 event at the Marina Bay Sands Expo and Convention Centre in Singapore. 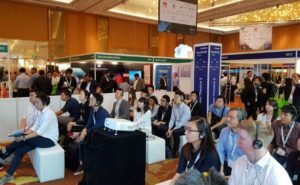 Produced in collaboration with the XR Alliance and the VR AR Association, the VR/AR Summit spanned the value chain of solutions driving enterprise adoption of AR and VR across Asia. For me, the highlights of the AR/VR Summit were the presentations by early adopters of AR and VR. We heard talks on implementations in Healthcare, Education, Entertainment, and Retail/eCommerce. Presenters included representatives from: Japanese telco KDDI; the National Institute of Education; Deloitte; the Singapore Radiological Society; payment provider Wirecard; and a few small Enterprise AR providers. These speakers shared their expertise, use cases, and useful tips for a successful AR/VR implementation. The overall tone was guarded optimism. While they generally agreed that AR/VR offers great promise, many presenters stressed the need to carefully calibrate customers’ expectations in the near term. I took advantage of the opportunity to introduce participants to the AREA – who we are and how we are working with our members and the ecosystem to advance the successful implementation of enterprise AR. It was a promising first step in developing the AREA ecosystem in Singapore and Asia-Pacific.